Soxfords is a super simple online sock store that carries both men’s and women’s professional themed socks. In addition to purchasing individual pairs of socks, they also offer a sock of the month club where you can choose between single gift-boxed pair or 2 gift-boxed pairs delivered monthly, and choose between men’s or women’s style socks. 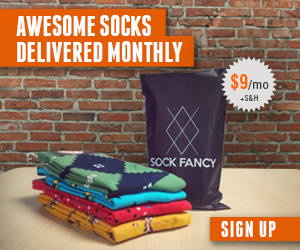 Check out Soxfords Sock of the month club here!